Terry Rudder- Age 58 of Fairview, Tennessee passed away September 28th in the comfort of his home that he loved so much. His sister, mother and niece were by his side. Preceded in death by his brother, Kristopher Rudder. He is survived by his mother, Marjorie Rudder; father, Douglas Rudder (Laura); sister, Sabrina Cyrus; niece, Brandi Maynard; great-niece, Taylor Turner; great-nephew, Austin Turner. Terry had worked in the entertainment business for many years. 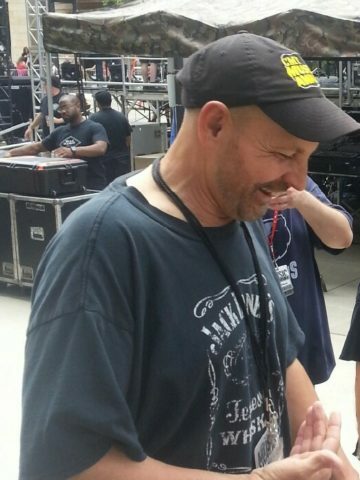 He worked several years for Johnny Paycheck and 30 years for IATSE local 46 as a stagehand and key grip. He was hard-working and loyal to his friends. His family was extremely important to him. Terry loved old TV shows, classic cars, fishing, gardening, University of Kentucky basketball and spending time by the creek while watching the hummingbirds. He had been fighting cancer since January 2018. He fought harder than anyone could ever imagine. He never gave up and fought until the very end. He was so brave and a true hero to his family and friends. He will be missed so much and was loved by all who knew him. There are no words to describe what a true gift from God he was to everyone he touched. Rest in peace with your Father in Heaven, Terry. A visitation will be 2-3 p.m. on Tuesday, October 2, 2018 at Harpeth Hills Funeral Home. A Celebration of Life Service will be at 3 p.m. on Tuesday at Harpeth Hills Funeral Home. Prayers are with you and your family. Our deepest condolences on Terry’s passing. Sabrina, you went far beyond the care and comfort for Terry and as a result he tried his very very best to not give up. You are remarkable and I am sure Terry shared his gratitude many many times. Let Terry’s whole life experiences motivate you and others to new heights. Condolences! Heaven has gained another angel. Loved by many and missed by all. May God bring peace to this family. Heaven has gained another angel. Loved by many and missed by all. May God bring peace to this family. Terry is now healed and in God’s loving arms. Prayers for all of you. Rest in Peace old Friend. As a neighbor and friend it was sad to witness Terry’s fight all of 2018. On the other hand it was so remarkable to witness this man fight and prepare for Heaven. His love and caring for others gave him strength beyond words. He was totally focused on making sure his entire Family would be ready for their future when his time came. Ginger sure will miss playing fetch with her Terry down at the creek. You made me cry but you also made me smile. Yes, he loved his family, he loved you Goose n was crazy about Ginger. Thanks to you, Aurie n Ginger for supporting him during his fight with this horrible, evil disease. You are appreciated beyond words! After many years out of touch with Terry, we are saddened to learn of his passing. He often worked as a fill-in for me at my music store, and even on occasion at my house. He was dedicated to his job and well respected around the area. We shared the love of old cars/trucks and he even drove by my house one day just to “show-off” one of his favorites!! My wife and I extend our sympathy to all family and friends. R.I.P. Terry, at your heavenly creek where the hummingbirds never leave and UK Basketball is always on! Our hearts are heavy over the loss of your dear Terry. Our loving Creator wants to comfort you with his promise that, “God…will wipe out every tear from their eyes, and death will be no more, neither will mourning nor outcry nor pain be anymore. The former things have passed away.” (Revelation 21:3,4) May this promise bring you comfort and hope.